A fun, newsworthy and emotional show capped off by an all-time great G1 Climax final between Tetsuya Naito and Kenny Omega. 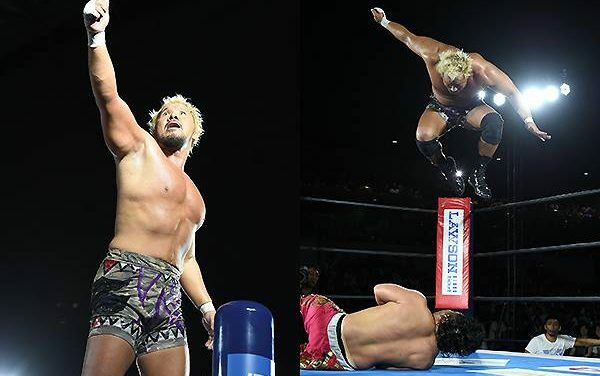 Kazuchika Okada vs. Kenny Omega was a masterpiece of a match that has to be watched. As good as pro wrestling gets. 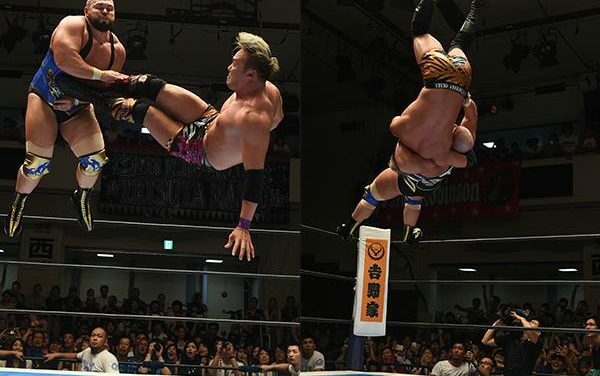 Highly recommend checking out Okada vs. Suzuki and Elgin vs. EVIL no matter what. Thumbs up for Night 16 of the G1 Climax 27. G1 Climax 27 Night 15 was highlighted by a must-see Tanahashi vs. Ishii match and backed by a pair of four star matches. 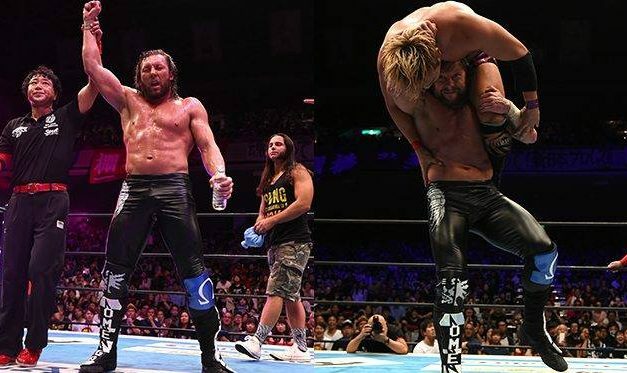 G1 Climax 27 Night 14 was a great showing from the B Block and a strong rebound after they had arguably the worst show of the tournament in Night 12. G1 Climax 27 Night 13 was a breeze to watch, and unless you’ve reached the point where you’re cherry-picking only the best, it’s worth your time. 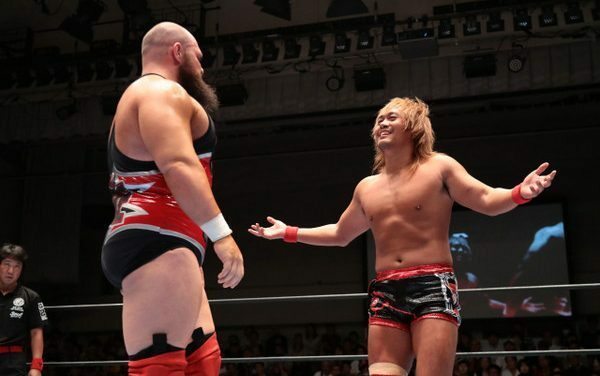 Both Ishii/Nagata and Ibushi/Tanahashi as must-sees from Night 11 of the G1 Climax 27. Night 10 of NJPW’s G1 Climax was one of the lesser G1 shows up to this point with only the top two matches being must-see. Night 9 officially marked the halfway point for the G1 Climax 27 A Block, and as a whole, it was a very solid show, but not spectacular. NJPW G1 Climax 27 Night 6 featured some fun matches, but nothing you have to go out of your way to check out. YOSHI-HASHI vs. Ishii and the lovely story telling beats of Nagata vs. Naito are the essentials from NJPW’s G1 Climax 27 Night 7. NJPW G1 Climax 27 Night 4 produced both the worst and one of the best matches in the tournament thus far. I’m a hard marker and still gave three matches **** and the rest ***+. That should be enough to tell you how great NJPW’s G1 Climax 27 Night 3 was. G1 Climax 27 Night 2 was a very easy show to watch. Fun opening two matches, and four G1 matches that ranged from good to fantastic. 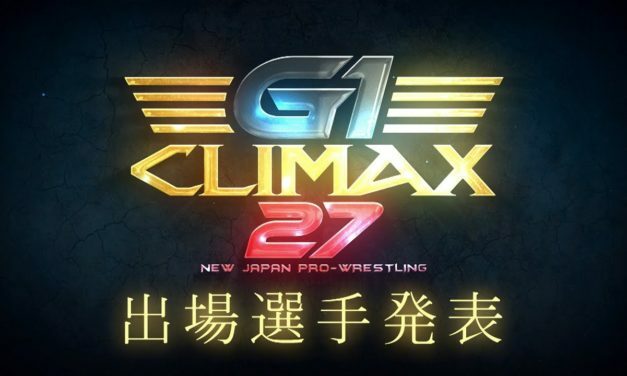 Today is the FINAL day to sign up for our G1 Climax 27 Pick’Em Contest. Don’t miss out! Four weeks ago, thinking this tournament could stack up to the previous three years would have been considered incredibly optimistic. Now that it’s over, we have to legitimately ask ourselves, was this the best G1 yet? Nights 6 and 7 saw veterans Yuji Nagata and Togi Makabe take the leads in their respective blocks. Let’s see What We Learned from both shows. Overall, Night 4 of G1 Climax 26 was a good, not great, show that ended with two very good matches. NJPW G1 Climax 25 Final Recap Video: Tanahashi vs Nakamura, ROH Announcement, Tenryu, BUSHI & more! The NJPW G1 Climax is over for 2015, so Rob McCarron looks back at the results, final standings, non-G1 ongoings, and future events and matches in the final VOW Recap Video for the 2015 G1! 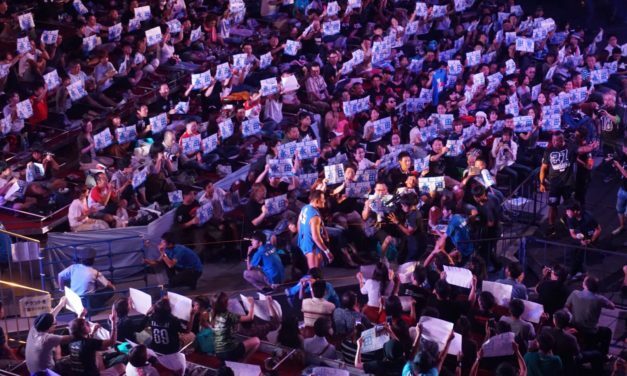 This was the best night of the tournament so far, with every single match being a fun watch at minimum. 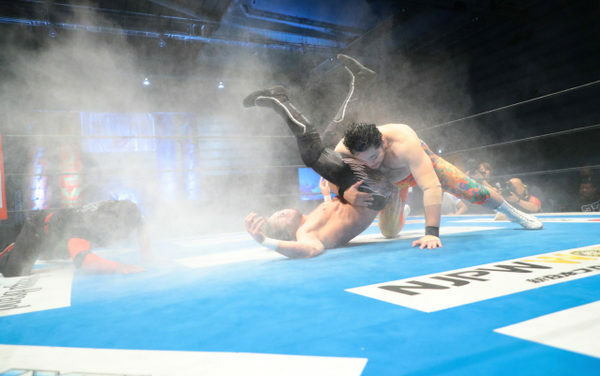 Overall, the tournament has slowly been creeping up to the quality of the previous two years, with a longer list of outstanding matches than you might think, including multiple MOTY level bouts. If you’re feeling the G1 Climax burnout (I don’t blame you), just watch the main event. It was a spectacular, all-time great G1 Climax match. NJPW’s final night in Korakuen Hall for this year’s G1 featured a main event of Tomoaki Honma vs Tomohiro Ishii. Could Honamania run wild in Tokyo for the first time in the G1!? The pre-G1 Climax tags were a lot of fun including what may have been the best multi-man tag this G1 season. The G1 matches themselves were a mixed bag as there weren’t great matches per se, but important and entertaining nonetheless. Nakamura looks to continue his momentum and Okada battles Ishii in a hard-hitting battle — it’s Night 12 of NJPW’s G1 Climax 25! NJPW G1 Climax 25 returns with Night 11 featuring a main event between Tetsuya Naito and Kota Ibushi! 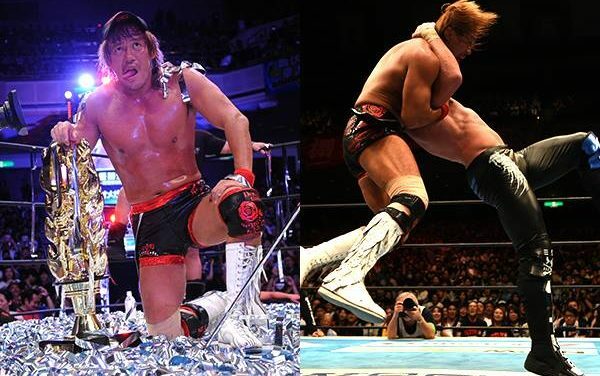 Naito vs. Ibushi, Naito vs. Ibushi, Naito vs. Ibushi. Our B Block crew is back at it looking to break up a massive four-way tie tie atop the block as Kazuchika Okada, Tomohiro Ishii, Karl Anderson and Hirooki Goto all tout six points. Night 9 of the 2015 NJPW G1 Climax 25 is underway with a main event of Hiroshi Tanahashi vs Toru Yano, and a Bullet Club member continues his roll in the G1 undercards. 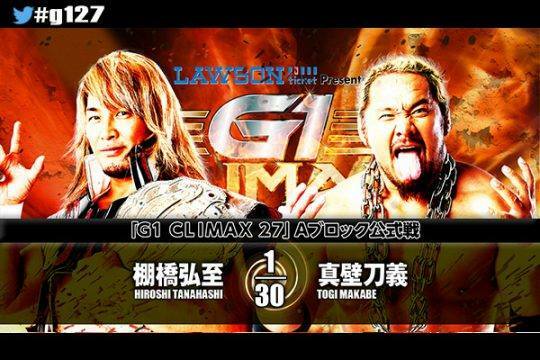 It’s Champion vs. Champion in the main event of Night 8 of NJPW’s G1 Climax 25. Night 7 of the 2015 NJPW G1 Climax features a double main event of Bad Luck Fale vs Hiroshi Tanahashi and Tetsuya Naito vs AJ Styles. LOS INGOBERNABLES! NJPW resumed this year’s G1 after a day off with Night 6 in Oita, featuring Satoshi Kojima vs Kazuchika Okada in the main event. Shinsuke Nakamura vs Michael Elgin didn’t take place, as Nakamura is injured, so his status for the rest of the tournament remains in question. 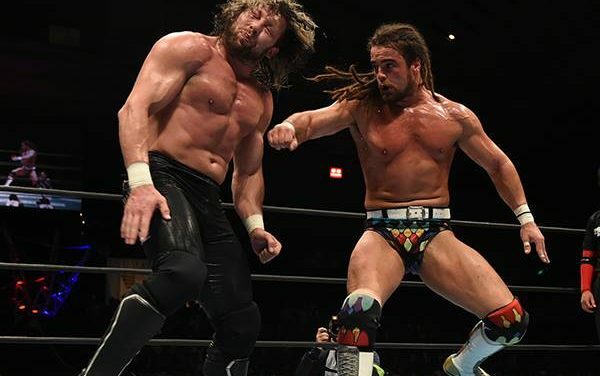 NJPW G1 Climax 25 action rolls on with Night 5, the third matches in the A Block. AJ Styles and Hiroshi Tanahashi walk in with leads, but would they walk out that way? 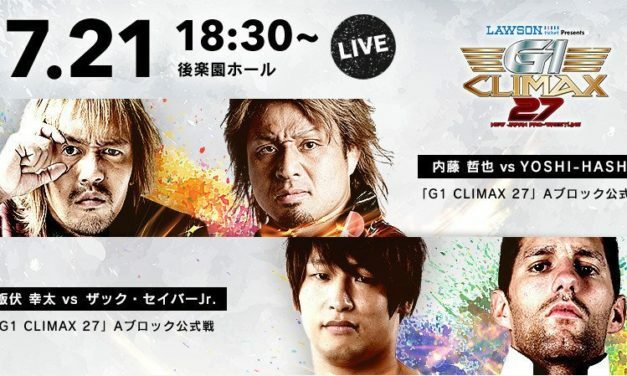 The first three 2015 New Japan Pro Wrestling G1 Climax shows could best be described as a mixed bag, with the tournament now rolling into Kagawa for Night 4. Tanahashi vs Tenzan & Shibata vs Naito highlight Night 3 of the 25th G1 Climax. NJPW G1 Climax 25 continues on with Night 2 in Shizuoka featuring a main event of Shinsuke Nakamura vs Karl Anderson! New Japan Pro Wrestling G1 Climax 25 begins with the A Block and two highly anticipated matches: Hiroshi Tanahashi vs Kota Ibushi and AJ Styles vs Katsuyori Shibata!